This is a guest article by Gio Fitzpatrick. Step out of the thunderous traffic and into a grove of giant evergreen oaks. Here, the dappled light filters down onto beds of artist’s acanthus alongside other shiny, exotic beauties. Through the foliage, a brick mansion stands regal. One’s eyes tell of a 19th century estate in southern Europe - an impression only reinforced when the path ahead is crossed by a zooming blur of black feathers and orange beak. It’s July, so where are the sweet notes of the nightingale? The airwaves here speak not of summer’s African warbler and flycatcher migrants, but of birds escaping the chilly hills to ride out winter on the coastal plain. This paradoxical garden says 'pip… pip pip pipipipipipipi', 'yak-ah-yak! ', 'tzz tzzzz tzzz' and 'birip beep beep.' And what sent that European blackbird hurtling so frantically over the path before? A big female collared sparrowhawk – one of Australia’s fiercest bird-hunters. 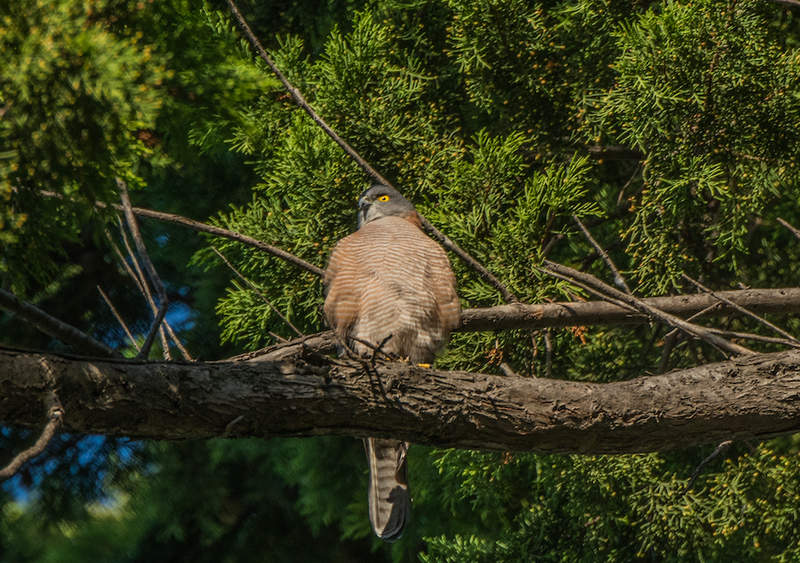 An electrifying sight anywhere, but particularly in the city; this collared sparrowhawk is one of a pair which have found the gardens of Rippon Lea Estate to be a rewarding hunting ground. Upon entering Rippon Lea Estate on the 15th of July 2017, I instantly heard the call of an eastern spinebill, then a second and a third. 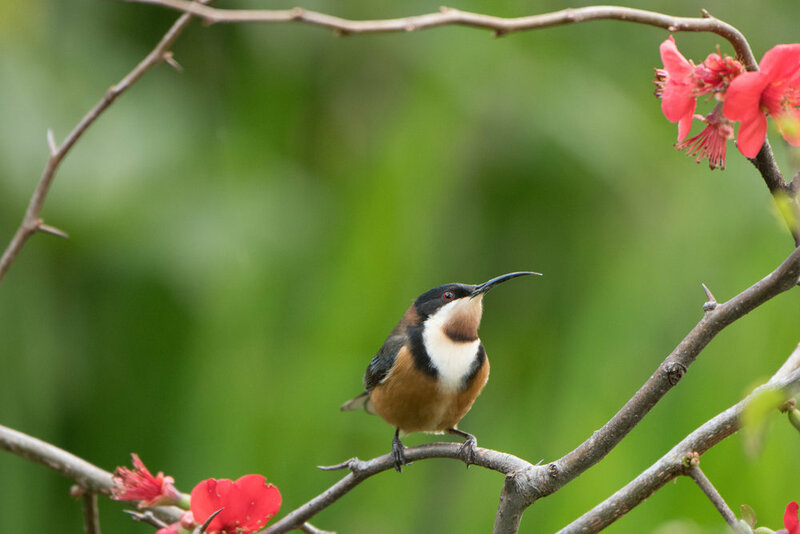 In five years of surveying wildlife at the nearby Elster Creek and Elwood Canal I have personally seen 140 bird species… but never an eastern spinebill. So I walked and counted for an hour, and the astounding picture became clearer. 15 brown thornbills, 13 silvereyes, two spotted pardalotes and two grey fantails. This list represents some of south-east Australia’s most common and characteristic “bush birds”, but at the same time, they are all species that have been dramatically dropping out of the urban landscape in recent years. To meet with them in such a healthy state at Rippon Lea filled me with joy and presented a learning opportunity. Eastern spinebills fly down from the ranges to the coastal plain in the cooler months. Their long bill and tongue is well suited to the local native fuchsia Correa reflexa which starts flowering as the birds arrive in March and finishes just as the birds leave in September. In Rippon Lea, they must turn their attention to exotic flowers. Rippon Lea Estate is in the care of the National Trust, who are 'working towards conserving and protecting our heritage for future generations to enjoy.' So despite my great surprise at the natural riches of this historic garden, the fact that it is also inadvertently conserving our pre-historic heritage indeed seems quite fitting. The puzzle, though, is that of our various inland parks, why should the one to host the most intact community of indigenous birds also be the one most totally devoid of indigenous plants? These birds have evolved to suit the native forests and heaths of south-eastern Australia. So why do they shun most of our parks which are fairly well adorned with indigenous plants? Eastern spinebills fly down from the ranges to the coastal plain in the cooler months. Their long bill and tongue are well suited to the local native fuchsia Correa reflexa, which starts flowering as the birds arrive in March and finishes just as the birds leave in September. In Rippon Lea, they must turn their attention to exotic flowers. The stretch of Elster Creek which runs between Foam and Wave Streets in Elwood, for example, has been the focus of revegetation efforts for decades. In it grows a complex indigenous plant community, providing a wholesome structure from the ground up. It looks like a great success of habitat creation, but once again, as on entering the Rippon Lea gardens, the ears quickly tell us what the eyes have missed. You will not hear the calls of the brown thornbill, silvereye, eastern spinebill or grey fantail here - I have not in five years. This is a soundscape almost totally dominated by just one species - the noisy miner - and the same is now true for all other large green spaces in the region, except for the coastal scrubs and Rippon Lea Estate. Not to be confused with the introduced common myna, the noisy miner is a native honeyeater. In fact, it is about as Australian as they come. Ecologist Tim Low remarked in his book, Where Song Began, that 'A reading of recent research shows that Australian birds are more likely than most to eat sweet foods, live in complex societies, lead long lives, attack other birds and be intelligent and loud.' The noisy miner fits these criteria to a higher degree than perhaps any other bird (although its relative, the bell miner, is a close contender). Perhaps they would be more accurately described as noisy farmers, for their favourite food is harvested and protected with the utmost diligence so as to ensure a prolific and regenerating crop. If the birds are farmers, then their crop is lerp (tiny white caps, made mostly of sugars, which often appear on eucalyptus leaves) and their livestock are psyllids (sap-sucking insects which create the lerp from waste products and live under it for shelter). Both the psyllids and their lerp creations are relished as food by a great multitude of birds, but the miner-farmers are quite unique in that they will carefully peel away the lerp without taking the insect underneath. The psyllid is therefore left to live another day and build another lerp. It is of no use, however, to cultivate a reliable resource if other competitor species are going to reap the rewards, so noisy miners combine their gentle harvest with cooperation among their fellows and a hyper level of aggression towards other species which is unparalleled in the bird world. Birds of all sizes are mobbed relentlessly and smaller birds such as pardalotes are often killed. As for their noisy namesake, these birds vocalise almost continually from dawn to dusk. They are communicating between members of the colony but also projecting a wall of sound around their territory – a warning which most birds, from fairy-wrens to falcons, tend to heed. At times, the lerp farms can be so prolific in the absence of insectivorous birds that the host trees die en masse and the whole ecosystem crumbles. That is an immense ecological influence for just one bird species and it is this unique ability that has earned it the seldom-used label of a 'reverse keystone species', which is to say that the arrival of this bird in an ecosystem is akin to removing the keystone from an arch. One study found that as noisy miner population density increased from 0 per hectare to 0.6 per hectare, the number of species of small bush birds halved. At the beginning of European settlement in Melbourne, noisy miner colonies were probably quite uncommon and patchily distributed in a few pockets of suitable habitat along the lower Yarra River, where they could hold the fort against intruders. These pockets would have been characterised by scattered, open eucalypt canopies and short grass - grazed by kangaroos - with minimal cluttered vegetation in between. While the mobs of grazing roos have been replaced by the lawn mower, urban parks and golf courses mimic this habitat type closely enough in the eyes of noisy miners to invite the colonisation of vast new lands. A silvereye snacking on some Cotoneaster glaucophyllus berries. One of their earliest nearby outposts was Braeside Park in the 1970s. From there they hopped, park to park, decimating bird communities as they went. They were first reported in St Kilda in the late 1980s, when Geoff Price noticed a few in eucalypts behind the St Kilda Library. Over the following years they were to invade every suitable patch in the region, increasing in number until they plateaued around the mid-2000s. It was at this time of expansion that the abundant white-plumed honeyeaters vanished from the St Kilda Botanical Gardens, never to be seen again (they’ve now been relegated to odd places like public car parks where there are just enough eucalypts for their needs but not enough for a miner colony). At the same time the little falcons, which would nest each year atop a Canary Island pine, raised their last offspring. Yellow-rumped thornbills could no longer be found at their usual haunts in the Elsternwick Golf Course and Albert Park (soon becoming locally extinct in both municipalities of Bayside and Port Phillip) and the spring arrival of the sacred kingfishers became a rare sight. I was lucky enough to see a sacred kingfisher briefly in the St Kilda Botanical Gardens in October 2012. The next morning, I slung an iPod speaker in a tree and broadcasted the kingfisher’s call. Scarcely ten seconds had elapsed of waiting for the real kingfisher’s reply when the speaker was engulfed by an angry hoard of noisy miners. It seems likely that the spread of the noisy miner has had a greater impact on indigenous bird communities than have all introduced birds combined. You could say that the noisy miner is pardalote enemy number one! But it is important to remember that their unnatural proliferation in Melbourne is a symptom of our own unnatural activities over the last 182 years. As a result, it retains healthy populations of some of the small bird species which have become less common in other parks in the last 15 years. When these small birds do occur in other nearby parks, they generally lie low in the dark, miner-free zones with ample cover, such as the north-east corner of the St Kilda Botanical Gardens. At Rippon Lea, they are noticeably more brazen, often working the outer foliage or even the leafless deciduous trees. I had previously considered the Royal Botanical Gardens in Melbourne to be the best place to see eastern spinebills in the area, but proportionately they seem to have a greater presence at Rippon Lea. The same is true for nankeen night herons, which often roost in the open during the day around the estate’s lake. Grey fantails have never been recorded in the City of Port Phillip in August but just over the Hotham Street municipal border they have apparently stayed through this winter. It is now eleven years since the last collared sparrowhawks nested in the City of Port Phillip at Alma Park, but recent observations suggest that they may be preparing to nest in Rippon Lea’s tallest Monterey cypress. An immature nankeen night heron roosting in an unusually open situation. The trees around Rippon Lea’s lake also happen to support what is undoubtedly one of Melbourne and Port Phillip Bay’s largest little pied cormorant roosts. Observations made just over the last month already point to a special importance of the Rippon Lea Estate for local wintering birds. A more detailed picture of its benefit to broader biodiversity will emerge during the spring and autumn seasons of bird migration. I suspect that this garden will prove to be a welcome migration stepping stone in an otherwise fairly hostile landscape, with likely visits by the rose robin, pink robin, rufous fantail, golden whistler and sacred kingfisher (judging by the habitat present). It is also a living laboratory. Through its pronounced contrast with other parks, the Rippon Lea Estate is offering ecological insights which will inform better care and understanding of nature in the city. Gio Fitzpatrick is a dedicated 20-year-old urban ecologist and conservationist, who was endorsed for his environmental volunteer work by Sir David Attenborough at age sixteen. All images courtesy of Gio Fitzpatrick. This is a guest post by Bruna Costa. Clive and Joan prepare for an evening under the stars in Kings Domain. Racing along the freeway towards the city at peak hour, they gradually approach their destination: the first of a series of summer concerts at the Sidney Myer Music Bowl featuring the Melbourne Symphony Orchestra. On the opposite side of the median strip, queues of cars crawl out of the city at a snail’s pace. Clive and Joan share feelings of empathy for commuters trying to make their way home. The couple reaches their destination and Clive is relieved to find a parking space beside the Royal Botanic Gardens. From there, it’s a short walk to the Bowl. He and Joan empty the boot of their paraphernalia. Joan carries a bag with the thermos, two cups and some nibbles. Clive carries the small esky filled with cold drinks and tucks the picnic rug under his arm. They wear their rain jackets. After all, this is Melbourne and threatening clouds hang in the sky – best to be safe on an evening like this. Clive and Joan hurry towards the Yarra River and turn left into the Tan along Alexandra Avenue. Small groups of two or three people, also carrying their picnic bits and pieces, stroll along in the same direction. Joggers, wired up and clad in lycra shorts, race along the Tan going the opposite way to the couple. With brows covered in beads of sweat, the fitness fanatics pant in rhythm to their running feet in pursuit of an entirely different agenda for their evening. Clive walks briskly. He wants to claim a spot on the hilltop, directly in front of centre stage. But Joan lags behind. She dallies, blissfully embracing the richness of the ambiance surrounding her. Like the Yarra. She likens it to a moat framing the south side of the city. It not only reflects the skyscrapers on its rippling water, but also the tranquility that comes at the end of a hectic day. Oaks, elms and plane trees - their branches intertwine to form an archway over the road and the path on which drivers and pedestrians commute, offering dappling shade and oxygenated air throughout the day. A sequence of succulents in shades of bottle green, light green, grey-green and silvery green, with a smattering of deep burgundy, line this section of the Tan. Joan marvels at their glossy colours and contrasting shapes. Round leaves, narrow leaves, and some thorny leaves, all line up in front of the wrought iron fence. The plants reach out, trying to connect with the passing parade. In her absent-mindedness, Joan extends the gap between her and Clive. She needs to catch up to him and alternates her jogging with brisk walking until she’s by his side. Gasping for breath, she questions why he has to walk so fast. But Clive is on a mission, visualising his preferred spot on the lawn at the venue. They turn off the Tan onto the pathway into Kings Domain and cut across the grass to save time. ‘We have to reach the gates of the Music Bowl before the queues get too long,’ says Clive, dashing ahead as he speaks. But once again, Joan is mesmerised by the flowering shrubs that border the lawns, their lush foliage, wet and shiny from an earlier rainfall. After enduring weeks of hot, dry weather, the revived garden emanates a rich, earthy aroma. It rouses childhood memories of mushroom-picking days on foggy mornings in Werribee, where mushrooms that sprouted beside cow pats on fertile fields emitted that scent of fresh fungi. She glances down at the damp lawn, not looking for mushrooms, but instead noticing that the wet blades of grass have left dark smudges on her leather shoes. Unperturbed, Joan walks on beneath tall trees, some hundreds of years old. She marvels at the array of trunks in various girths and contrasting textures. She gazes in wonder at the mighty magnolia, at its trunk and exposed roots. She slows, and admires their snake-like forms, curving and slithering beneath the grassy surface, anchoring the towering trunk to the ground. She recalls the words of the famous artist, Sir Hans Heysen, who once said that trees were much like humans, each one bearing its own uniqueness. Joan had never looked at trees with such fascination before reading the artist’s sentiment. She thought Heysen an admirable artist who recognised the beauty and individualism of these stately natural monuments. She had read how he spent hours observing the trunks of eucalyptus trees at various stages of the day; how he recorded the hues and shifting shadows that played on a tree trunk as the sun altered its position in the sky; how he captured those colour variances in his artwork. Joan pictures the artist, seated away from his chosen tree, applying bold strokes to his canvas to create his masterpiece. Again, she hurries through the park to catch up to Clive who has arrived at the gates of the Bowl’s entrance. She lines up beside him. They wait to be counted and for their bags to be checked, a necessary routine. Already, the crowd is larger than they expected. Although rain threatens to spoil the evening, free concerts are becoming more popular. The couple makes their way through the crowd, reaching the top of the hill to find a patch of grass big enough for their rug. Making themselves comfortable, Clive adjusts his hat. Joan checks her watch. There’s plenty of time before the concert begins so she takes her binoculars and casually spies on the multitude to see if anyone she knows is out there. The nibbles, the dip, the water bottles can wait. The sun slowly drifts towards the west, smudging the amassing clouds with shades of purple and orange. One by one, the musicians clad in black cross the stage and take their seat. They tinker with their instruments. A cacophony of discord arises from beneath the canopy of the Bowl as the fine tuning begins. Spectators continue to file in, meeting and greeting friends, squeezing into dwindling spaces on the lawn. People continue their friendly chatter while the presenter thanks the sponsors for making these concerts possible. Joan mumbles to Clive about how rude some people can be. Then the presenter proudly introduces the conductor who is of international calibre. He marches onto the stage. The spectators applaud. He bows to the audience, turns to face the orchestra and raises his baton. A hushed silence descends over the crowd. The musicians are poised, ready to strike, strum, or blow their instruments. In the distance, lightning slashes across the sky. Thunder rumbles through a dark grey cloud mass. The audience gasps - but the clouds are too distant to dampen the enthusiasm of spectators and conductor. He turns to face the crowd and their applause is encouraging. Like Clive and Joan, most have come prepared with umbrellas and rain jackets. A spot of Melbourne rain won’t last and definitely will not deter the audience. They sit back and wait for the conductor to lead the orchestra into the first piece of the evening. And so the concert begins. By interval, lights from tall city buildings speckle the darkening sky. Clouds drifting overhead have dispersed, leaving a semblance of tatty cotton balls that temporarily conceal the stars. One by one, flying foxes take to the air and fly east, away from the setting sun. After the finale, the orchestra is rewarded with loud applause, cheers and whistles until they submit to an encore. Joan applauds enthusiastically after the finale. Clive collects their paraphernalia. The audience leaves satisfied, relaxed and reinvigorated with the fresh night air. The couple strolls back along the Tan, grateful to have been able to attend a pleasant evening in their beautiful city. Bruna Costa has worked in kindergartens for 26 years, and currently works with a 3-year-old group. She is a member of Write Track Writers' Group in Box Hill, and enjoys bird-spotting in bushland and her local area.